Coming from the girl who couldn’t get past the 8th pipe on Flappy Bird, it’s obvious that it was a bad idea to have me play and write about Snack Studios’ latest game for Android called Jumping Jean. I can’t count how many times I’ve died and screamed at my phone because of this game. I’ve had family members run from the other room and ask me “What’s wrong?” When they ask, I make them play the game too. At first they go, “Ohh, okay” which is a sign that they understand the game-play. And then you hear them go, “What?! Dude it’s so hard!” and your hopes of getting past the first level is crushed along with their spirit. In this new game powered by Unity, you are placed in a 2D Super Mario Brothers-like environment with pixel hero characters roaming around the place. It’s like the hangout of the main characters in every 8-bit game. There’s a character that looks like it was inspired by Mario but with blonde hair and a red jump suit. And there was a much bigger Mario that looked like he got a hold of a magic mushroom (no 420 puns intended). There was a purple-themed character that looked similar to Waluigi, and a buff looking character that seemed like he was wearing boxing gloves. There were even princess-themed characters jumping around and floating down with their puffy dresses. In any case, chilling and interacting with your favorite pixel princess would be cool- if only she wasn’t trying to kill you. That’s right, you’re not part of their party, and you can’t have any fun. Because in this game, you are not the versatile hero that you know you can be. In this game, you’re the limited-to-movement, obviously insignificant, “this is totally rigged” character trying to get in everybody’s way. In the Mario World you would be the tiny angry mushroom killing players that were too distracted to have noticed you. But in Jumping Jean, you’re the main character. The game-play is simple: Tap to move left, tap to move right. You can’t jump, you can’t duck, and you don’t have powers. This seemed unfair to me at first, but then I realized it was how these tiny mushrooms things at Super Mario Bros lived their coded lives daily. They were coded to have the lower-hand. They were coded to be a nuisance. They were made to lose. 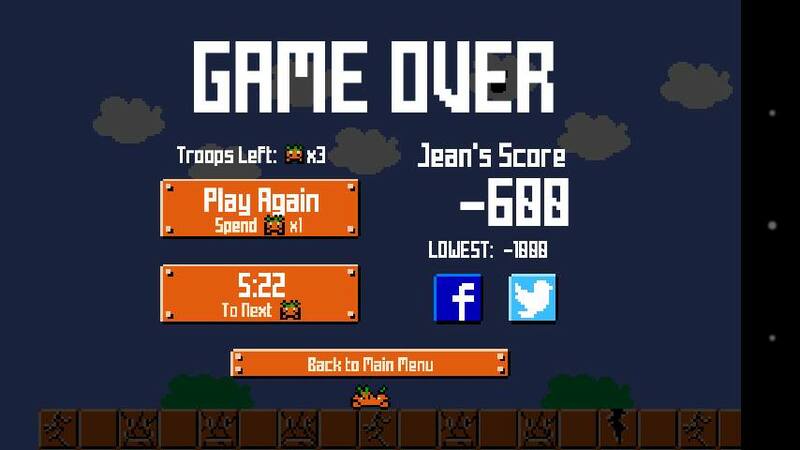 And this is what makes Jumping Jean such a challenging game. Imagine being made to lose, but succeeding anyway? That’s what a true underdog is. In fact, it’s these ideals that made Snack Studios conceptualize Jumping Jean. In this game, you are given the task and point of view of the villain, but not a powerful villain that can raise their hand and summon minions. Quickfire Games and Snack Studios wanted a game for the-little-guy. They wanted a game that can be won through perseverance, regardless of how powerless your character is. It’s a difficult game (it’s damn hard!) It’s pretty addicting, too. Imagine playing Flappy Bird, but you’re a pipe and you can’t move. You’re just… there. How do you win with all the odds stacked up against you? If you think you can, you can give Jumping Jean a try and sign up for Quickfire Games’ beta-testers list at http://bit.ly/jjsignup Like the Jumping Jean and Quickfire Games fanpage on Facebook, and try playing the little guy for once. Let’s see how well you do!